Plucking, preening and pampering ourselves to the point of smooth perfection is a common beauty pursuit. Yet one woman has decided to shun modern societal beauty (mis)conceptions and go au naturale. 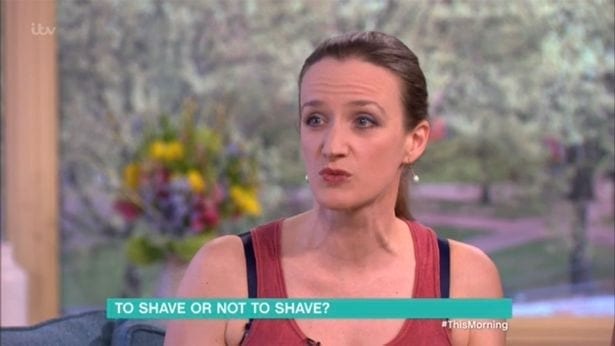 Kate Smurthwaite recently displayed her underarm hair on ITV’s This Morning to show women they shouldn’t feel pressure to shave. Kate hasn’t shaved for five years and while the growth of bodily hair is perfectly natural – because biology and evolution exist – some viewers branded her ‘disgusting’. It’s not manicured, I don’t do anything. I don’t want women to feel like there’s something wrong with their natural body. Also on the show was Lizzie Cundy – a former WAG – who said she believed most men and women would find bodily hair ‘unattractive’. I’m sorry it actually makes me feel quite queasy and ill. I do think it’s unattractive and I think most men and women don’t like underarm hair. It’s like Flintstones-ages, we’ve come a long way since then. I think #ThisMorning should get #LizzieCundy to grow her arm pit hair. Although the topic is evidently somewhat of a contentious issue, many have called out This Morning for entertaining a debate which is inherently subjective and entirely up to each individual woman. Furthermore, vocalising the argument, men don’t like the look of underarm hair, really missed the mark in terms of empowering women to do what they want with their bodies, rather than what their prospective partners want.